Coin World has reported that The Olsen specimen 1913 Liberty Head nickel, the most famous of five known specimens, will be auctioned by Heritage on Platinum Night at the 2010 FUN Sale in Orlando in January. The coin is graded Proof-64 by PCGS. It has the distinction of being the only 1913 Liberty Head nickel ever handled by B. Max Mehl, who made it a centerpiece of his lifelong advertising campaign. It was also briefly owned by Egyptian King Farouk. When the set of five 1913 nickels was broken up in the 1940s, the Olsen specimen was sold first to James Kelly and then to Fred Olsen, whose name it has kept ever since. 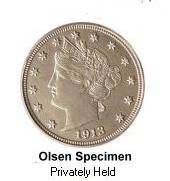 The Olsen specimen was featured on "The $100,000 Nickel" episode of Hawaii Five-O soon after it broke the record for the most expensive coin ever sold in 1972. During the episode, the "star" coin is stolen by a thief and spends much of the episode passing from hand to hand as the human stars of the program look for it. The coin’s price doubled to $200,000 when it was purchased by Superior Galleries in 1978. It has been resold on several occasions since then, most recently fetching $3 million in June of 2004. The 1913 Liberty Head Nickel is one of the most famous US coins. With only 5 made, it is truly a remarkable coin. Liberty Head nickels dated 1913 first came to the attention of the numismatic community in 1920. All five were in the possession of Samuel Brown, a numismatist who attended the American Numismatic Association’s annual convention and displayed the coins there. Brown had previously placed an advertisement in The Numismatist in December 1919 seeking information on these coins and offering to pay $500 for each. Ostensibly, the coins had been purchased as a result of this offer. However, Samuel Brown had been a Mint employee in 1913, and many numismatic historians have concluded that he was responsible for striking the coins himself and then removing them from the Mint. Official records from the Mint do not record any Liberty Head nickels produced in 1913, However, that in and of itself is not conclusive sice record keeping at the US Mint was somewhat lax and there are many examples of coins that exist today that lack official records of their coinage. Whatever the actual story is, we do know that in January 1924, Samuel Brown sold all five 1913 Liberty Head nickels, passing through the hands of several coin dealers before finally being purchased by Colonel E.H.R. Green (son of the infamous miser Hetty Green). Green kept them in his collection until his death in 1936. His estate was then auctioned off, and all five of the 1913 Liberty Head nickels were purchased by two dealers, Eric P. Newman and B.G. Johnson. The dealers broke up the set for the first time. Of the five 1913 Liberty Head nickels, two have proof surfaces, and the other three were produced with standard striking techniques. Purchased from Newman and Johnson by the Numismatic Gallery, a coin dealership that then sold it to famed collector Louis Eliasberg. It remained in Eliasberg’s comprehensive collection until after his death. In May 1996, it was sold at an auction conducted by Bowers and Merena, where it was purchased by rarities dealer Jay Parrino for US$1,485,000 – the most ever fetched by any single coin up until that point. When it was auctioned again in March 2001, the price climbed to US$1,840,000. 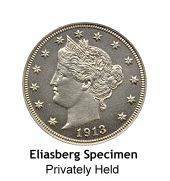 In May 2005, Legend Numismatics purchased the Eliasberg specimen for US$4,150,000. In 2007, the Eliasberg Specimen was sold to an unnamed collector in California for US$5 million. While the Eliasberg specimen is the best preserved of the five coins, the Olsen specimen is almost certainly the most famous. When Newman and Johnson broke up the set of five coins, the Olsen specimen was sold first to James Kelly and then to Fred Olsen. The latter collector sold the coin to Farouk, but his name has remained attached to it in numismatic circles ever since. In 1972, it was sold to World Wide Coin Investments for $100,000, thus inspiring its title appearance in Hawaii Five-O the following year. The coin’s price had doubled, to $200,000, when it was resold to Superior Galleries in 1978. It has been resold on several occasions since then, most recently fetching $3,000,000 in June 2004. The current owner’s name has not been disclosed. 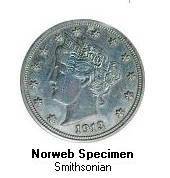 The Norweb specimen is one of two 1913 Liberty Head nickels that currently reside in museums. It is currently an exhibit at the Smithsonian Institution. Newman and Johnson sold the Norweb specimen to F.C.C. Boyd, who then resold it to the Numismatic Gallery (which handled several of the coins over the years). In 1949, it was purchased by King Farouk to replace the Olsen specimen, which he had sold. It remained in Farouk’s collection until he was deposed by Gamal Abdel Nasser in 1952. Two years after that, Farouk’s possessions were all auctioned off by the new regime. The specimen was once again handled by Numismatic Gallery, and sold this time to Ambassador Henry Norweb and his wife. In 1977, the Norwebs donated the specimen to the Smithsonian, where it remains today. 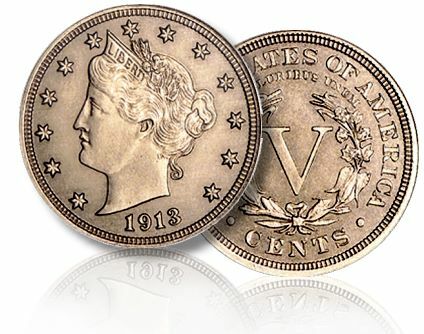 The Walton specimen is the most elusive of the five 1913 Liberty Head nickels; for over 40 years, its whereabouts were unknown and it was believed to have been lost. George O. Walton, for whom the specimen is named, purchased it from Newman and Johnson in 1945 for approximately $3,750. On March 9, 1962, Walton died in a car crash en route to a coin show. He had promised the show’s promoters that he would exhibit the 1913 Liberty Head nickel there, so it was assumed to have been among the coins in his possession when he died. A quarter-million dollars worth of coins were recovered from the crash site, and among them was the 1913 Liberty nickel in a custom-made holder. However, when his heirs later submitted Walton’s coins for a 1963 public auction, the nickel was returned because the auction house mistakenly thought it was not genuine. The coin remained in the possession of Walton’s heirs, kept in a strongbox on the floor of a closet in his sister’s home for over 40 years. In July 2003, the American Numismatic Association arranged to exhibit the four specimens whose whereabouts were known and a publicity campaign was launched promoting a nationwide hunt for the missing fifth specimen. Bowers and Merena auction house (at the time a division of Collectors Universe, Inc.) offered $1 million to purchase the coin or as a guarantee for consigning it to one of their public auctions. In addition, a $10,000 reward was offered just for letting representatives of Bowers and Merena be the first to see the genuine, missing fifth specimen. 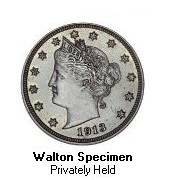 After learning about the reward, the Walton heirs brought their coin to the ANA convention in Baltimore where expert authenticators from Professional Coin Grading Service examined it at length, compared it to the other four known specimens and determined that, in fact, the Walton specimen was genuine. The coin is still owned by the Walton heirs and is on loan to the American Numismatic Association’s Edward C. Rochette Money Museum in Colorado Spings, Colorado. Currently held by the American Numismatic Association’s Money Museum, the McDermott Specimen has the distinction of being the only 1913 Liberty Head nickel to bear marks of circulation. From Johnson and Newman, it was sold to James Kelly, then to J.V. McDermott; it was this latter owner whose name became most prominently attached to the coin’s pedigree. McDermott often carried the coin around with him, showing it off to bar patrons and boasting of its extraordinary rarity and value. 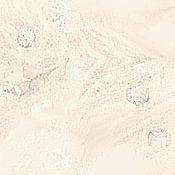 Due to this activity, the coin lost some of its original mint luster, becoming circulated in condition. Eventually, McDermott protected the coin with a holder to prevent further wear. After McDermott died, the coin was then sold at auction to Aubrey Bebee in 1967 for $46,000. 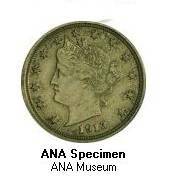 Bebee and his wife donated the coin to the ANA in 1989, where it is exhibited in the Money Museum.